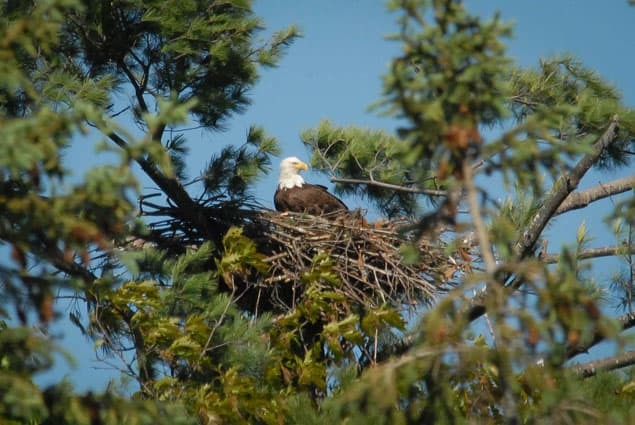 A bald eagle sits on a nest near Barnet along the Connecticut River. Bald eagles, once endangered, are now on the rise. During the 2014 nesting season,Vermont’s loon population had a record success, producing 65 fledglings (chicks that survived to leave the nest) on lakes and ponds throughout the state. Conversely, 2014 was a down year for the state’s nesting bald eagles, which produced only 17 fledglings, down from a modern-day record of 26 fledglings last year. Buck said that the off year was likely due to lingering winter weather and is not a reason for concern at this point because of the large number of adult eagles spotted throughout the state. Bald eagles are no longer a federally endangered species, but they are still listed under Vermont’s Endangered Species Act, as the birds have been slower to recover in the state. Vermont’s rare birds are monitored in a cooperative agreement between the Fish & Wildlife Department and its conservation partners, Vermont Center for Ecostudies and Audubon Vermont. Other monitored bird species saw mixed nesting success this year. Common terns produced only 16 fledglings out of 220 nests, due in part to depredation by gulls and great-horned owls on the nests. The grasshopper sparrow and black tern appeared to be stable in their small and limited habitats. Vermonters can help researchers in their effort to conserve birds by donating online to the non-game wildlife fund at www.vtfishandwildlife.com/support_nongame.cfm or by purchasing a newly redesigned conservation license plate, available in October.